Advertising is frequently critical to creating brand awareness. Even online conversion increases when you’re visible in the streetscape. And the effects of offline campaigns are also immediately felt on the shop floor. The effect of advertising increases when you know its pitfalls and limitations. You first need to get attention by being noticeable, but you also need to convey a message. That’s why every medium has its own requirements. Outdoor advertisement requires clear, punchy messages. TV campaigns also need to be effectively used as online preloaders. And advertisements can also be old-fashioned tempting. We don’t just do online; the traditional mix is also a speciality of ours. 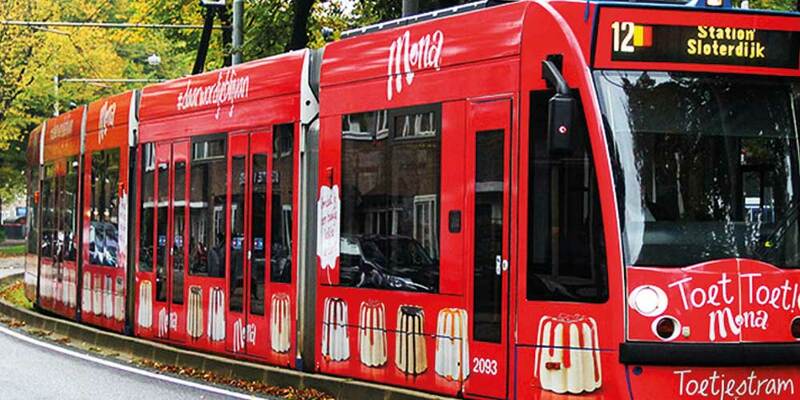 Desserts Day outdoor campaign: Mona distributes 15,321 desserts. We ensure that commercials stand out and count. Commercials that convey the right message, and build your brand within 15 seconds. A good commercial starts with a good idea. We develop commercials for radio and television which require less media, because they stand out more. Billboards, posters, spectaculars…. We still love outdoor advertising. You can communicate directly to the target group. Good outdoor advertisement is hard to ignore. Make sure the message is simple: no long texts or complicated puzzles. We develop outdoor campaigns with impact. Your brand’s promise on an A4 piece of paper. Advertisements with a clear message and promise build your brand. Whether it’s a new theme, a special offer or trade marketing. A good advertisement sticks. Advertising that can't be missed? Judith can tell you more!